Less was known regarding outcome of dilatation in corrosive stricture of the esophagus. The aim of this study was to report the treatment outcome of dilatation for corrosive esophageal stricture. 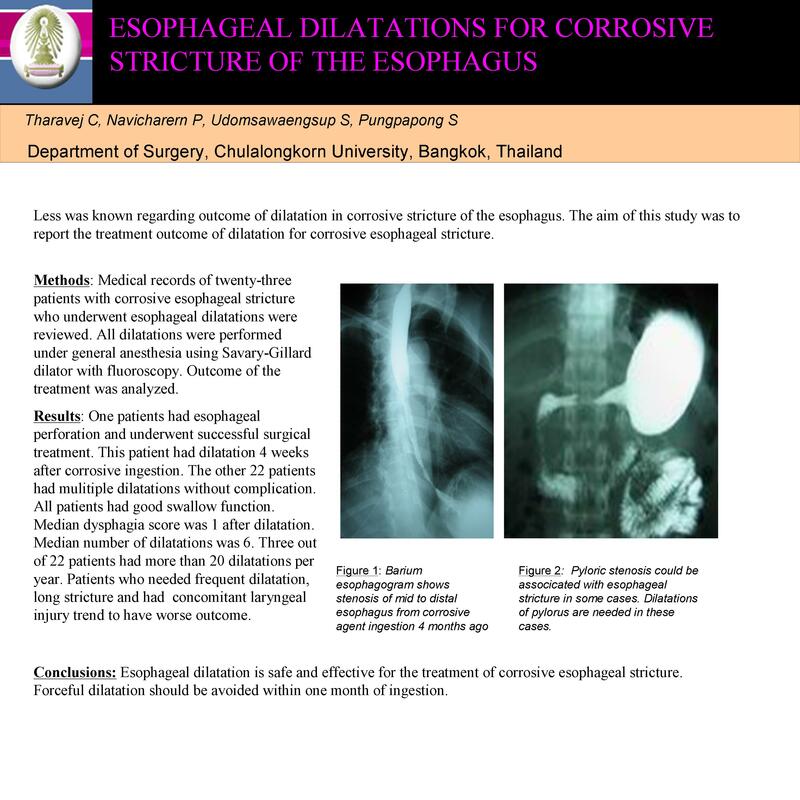 Methods: Medical records of twenty-three patients with corrosive esophageal stricture who underwent esophagal dilatations were reviewed. All dilatations were performed under general anesthesia using Savary-Gillard dilator with fluoroscopy. Outcome of the treatment was analysed. Results: One patients had esophageal perforation and underwent succesful surgical treatment. This patient had dilatation 4 weeks after corrosive ingestion. The other 22 patients had mulitiple dilatations without complication. All patients had good swallow function. Median dysphagia score was 1 after dilatation. Median number of dilatations was 6. Three out of 22 patients had more than 20 dilatations per year. Patients who needed frequent dilatation, long stricture and had laryngeal injury trend to have worse outcome. Conclusion: Esophageal dilatation is safe and effective for the treatment of corrosive esophageal stricture. Forceful dilatation should be avoided within one month of ingestion.